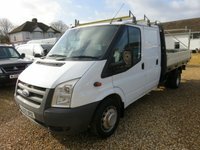 A very clean and tidy one owner ex ministry of defence Ford transit 350 MWB High Roof with a very good specification and finished off in Frozen White paintwork, Features include air conditioning, electric windows, heated windscreen, FM radio, CD player, aux input, 12v sockets, 6 speed gearbox, steering wheel volume controls, dual passenger seat, height adjustable drivers seat, drivers armrest, cup holders, full factory metal bulkhead, fully ply lined, carpeted floor over the ply, tow pack, ex ministry of defence one owner from new, immaculate condition and comes with our 5 Star service package included !!!! - FREE Service, FREE 6 Months Road Tax, FREE 3 Months Warranty, FREE Independent Vehicle Inspection and a CHOICE of either FREE Roof Bars, Tow Bar or Vehicle Graphics !!! NATIONWIDE DELIVERY AVAILABLE !!! RESERVE THIS VEHICLE TODAY WITH A SMALL DEPOSIT !! !